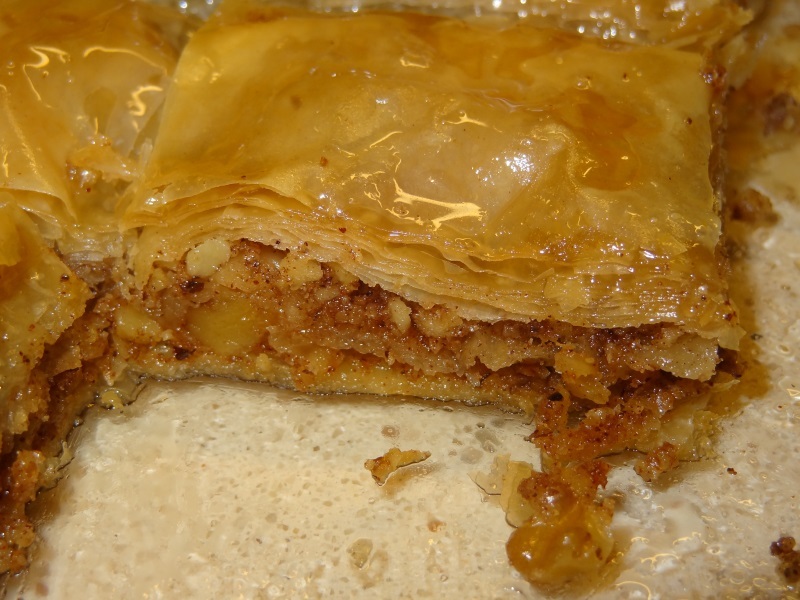 Homemade Baklava seems intimidating at first especially the phyllo dough but it is very easy once you know what to do. This recipe makes 2 9x 13 baklava – it’s so delicious. I like when the baklava is not to sweet and soaking in syrup. SO the syrup recipe is good for the 2 pans. as soon as your baklava comes out pour hot syrup on. Preheat oven to 350 degrees F(175 degrees C). Butter the bottoms and sides of a 9×13 inch pan. Chop nuts and mix with cinnamon. Set aside. Unroll package of phyllo dough. Cover phyllo with a dampened cloth to keep from drying out as you work. Place one sheet of dough in pan, butter thoroughly. Repeat until you have 8 sheets layered. Sprinkle nut mixture on top. Top again one sheet at time and butter dough. After a few more sheets add nuts. The top layer should be about 6 – 8 sheets deep. Using a sharp knife cut into diamond or square shapes all the way to the bottom of the pan. Bake for about 45 minutes until baklava is golden and crisp. Make syrup while baklava is baking. Boil sugar and water until sugar is melted. Add vanilla and honey. Simmer for about 10 minutes.